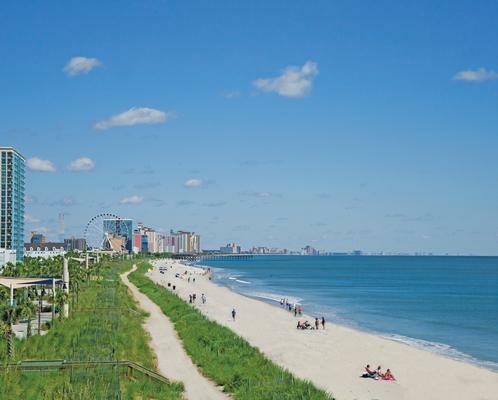 With spectacular views of the Atlantic Ocean as well as beautiful nature scenery, the Myrtle Beach area is the perfect place to knock out a few miles on a bicycle. Bringing the family along only adds to the fun and enjoyment of exploring the Grand Strand on two wheels. The highlight for cycling enthusiasts is Huntington Beach State Park&apos;s 26-mile bicycle trail that runs from Murrells Inlet all the way down to Litchfield Beach. Along the way, you&apos;ll see oceanfront forests and lagoons and the Atalaya castle. For more information, go to HuntingtonBeachSC.org. The Myrtle Beach area&apos;s newest shopping and dining wonder also boasts a fantastic 2-mile paved walking and bicycling trail that overlooks the area&apos;s lake and recreational fields. Spend some time outdoors before enjoying a good meal or one of The Market Common&apos;s many entertainment options. For more information, go to MarketCommonMB.com. Nestled along the Waccamaw River in downtown Conway is a scenic walking and bicycling path that takes nature enthusiasts on a relaxing, stress-free adventure. Don&apos;t forget to admire many of the old buildings along the route, and spend a little time embracing Conway&apos;s past. For more information, go to ConwayLive.com. Also known as "The Hulk," this local single-track mountain biking trail began in the summer of 2012. Located off River Oaks Drive in Carolina Forest, the Horry County Bike and Run Park doesn&apos;t let you off easy, beginning with a 30-foot hill climb before taking on the characteristics of a wooden rollercoaster. They call it "The Hulk" for a reason, but superpowers aren&apos;t needed. Instead, all you need is a sense of adventure and fun! For more information, go to WaccamawTrailBlazers.com. Just one mile south of the South Carolina state line, the lush Vereen Memorial Historical Gardens is 114-acre tract of woodlands and salt marshes that&apos;s a nature enthusiast&apos;s dream. Vereen Gardens hosts paths for bicyclists, joggers and hikers alike. You won&apos;t want to miss this! For more information, go to HorryCounty.org. If you&apos;re thinking about tackling this entire trail in one outing, you&apos;d better eat your Wheaties. The East Coast Greenway is a developing bicycle trail system that spans 3,000 miles, from Canada all the way to Key West. In the Myrtle Beach area, it crosses S.C. 31 near Carolina Forest. It continues to be a growing entity that will no doubt thrill bicycle enthusiasts of all ages. For more information, go to Greenway.org.